Rommel’s Desert Rats lurk somewhere out there. Somewhere in the dunes. Rumor is he has a new tank – the dreaded Tiger. Patrols are out, but have not yet returned. They are long overdue. Have they been captured by the Germans? Or have they fallen prey to something... else. There’s blood in the sand and death in the dunes, and those shapes you see shambling toward you might not be a mirage. 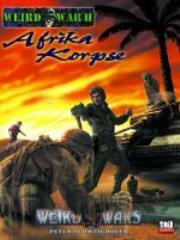 Written by former West End Games Star Wars Line Editor Peter Schweighofer, Afrika Korpse includes a complete description of the Weird War in Africa, including British and Italian forces and equipment, new weapons, prestige classes, skills, feats, horrors, twisted plots, and a whole tank-load of creepy adventure ideas for the war in the desert! This awesome 144-page book also adds a whole new type of ability – Weird Feats – that just might give your trooper an edge in the savage battles of Weird War Two. Find out just what Trembling Hands really means, or why some soldiers seem to heal faster beneath the blazing sun. Afrika Korpse is a setting for Pinacle Entertainment Group’s Weird Wars: Weird War Two roleplaying game, and requires the first book in the series, Blood on the Rhine. Weird War Two is a D20 System game and requires the Player’s Handbook.